Enlarged black and white contact sheet. 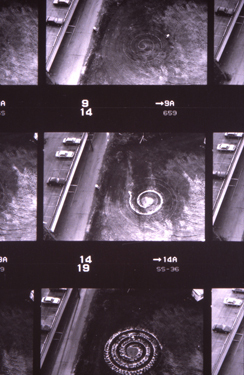 This contact sheet is documentation of a spiral drawing I made in the earth of a leveled lot before construction began. Drawn with wheat flour and sand, the spiral measures 44 feet in diameter. The roll of film was in the camera for two weeks and includes a range of images.